Didn't end up playing due to being excessively tired. Today was the summer solstice. I was pretty happy for it being so sunny today, the gardening store had also opened up shop, and Rosie had moved into town today, it was going to be an eventful day. My red hibiscus bushes grew - they should bloom around July 6! I began voyaging on over to the Town Square to meet Isebelle, so she could give me a special item, and I could get my photo taken. But Rosie's house was on the way so I decided to drop in and say hi. 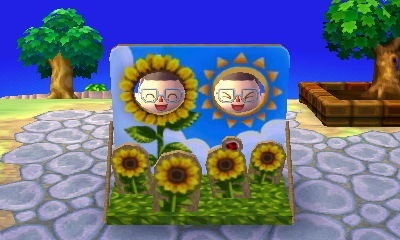 I hurried on over to the square, where Isabelle was waiting, soaking up the sun in her groovy sunflower-tee. After mucking around with the photoboard for a good 5 minutes, I hurried onto Main Street to introduce myself to Leif. I took no time hesitating to purchase it and soon went back to town to remove that blasted cherry tree smack down, right out the front of my house. Hallelujah, we're saved! Look at the excitement in those eyes! exotic fruit tree, or some bushes. Nook's Homes also had a neat looking door in stock today; it wasn't the Zen door I was eyeing off a few days ago but couldn't purchase due to renovations, but it was nice none the less. I made a purchase and shall look forward to seeing it tomorrow (hopefully it matches the fuchsia roof). Phineas was also in town today. He gave me three new badges, that leaves a grand total of four. Other than that, nothing overly exciting happened (Julian invited me over at 5:30 but I had to go out and buy dinner then and forgot, oops). Gala also put her minimalist lamp up for sale at Re-tail. I seem to like the minimalist set, and will probably try complete it. I seem to be feeling better from yesterday mishap, though I still have a slight headache, nothing a few glasses of water can't fix though. I'll probably continue playing for another hour or so (it's almost midnight) - not sure how much I'll be playing over the weekend. I have an English assessment due Thursday which I've yet to start, and a Maths assessment/test Friday which I've yet to study for. We'll see what happens, though. Oh and today's fortune cookie item was #18 - another coin, so I didn't bother posting it. Another pink tulip popped up! It was 8pm and still as sunny as midday. This is weird. I'm in the US so it's still morning here. They aren't kidding when they say daylight all day and night are they? Did the night bugs come out anyway? How do you get the photos from your 3DS on to your computer?